As president Trump relishes telling the story, he was sitting with President Xi of China, who was enjoying a beautiful, huge slice of chocolate cake — the best chocolate cake you ever saw, which can be enjoyed only at Mar-A-Lago — when Trump decided it was time to launch 59 cruise missiles at the Assad government. As Trump savors the story even more than the cake, we also see the Contradictor in Chief undermining his own advocacy for greater military spending. He describes the weapons — how “amazing” they are, and how incredibly precise and how there is nothing like them and how they can beat anything the competition has by a factor of at least five — all weapons that the military got during Obama’s administration! Then Trump spins to say that our military is seriously degraded in capacity or will be soon if we don’t do much better. At that point, I wiggle the plug in my brain to see if the connection came loose while I was listening. Nope. The president, again, smiles at the marvelous cachet with which he pulled this off over a fine diplomatic dinner at his expensive estate (where, by the way, you can buy a membership and dine with Chinese presidents … and American presidents). It makes great publicity for the president’s premier club because everyone wishes like Bartiromo that they could have been there to see that happen … and to enjoy the chocolate cake — the best you ever saw. Oh, how fun! You can just see Bartiroma wishing she had been there to watch this man of power in elegant action. But is it really that dignified to be talking gas over a fine dinner? While President Trump was quick to attack Assad and equally enthusiastic to boast about how he pulled it off, it remains far from clear that Bashar Assad was even the person responsible for the chemicals that caused death and injury in Syria. Many have raised the question as to whether this is a false-flag operation by ISIS to try to draw the US in. They know full well that Trump’s neocon government is itching for an excuse to eliminate Bashar Assad anyway. So, give them a reason they will be only too happy to accept, so long as you make it look plausible enough for the public. Just as Bush was all to ready to accept tales of yellowcake uranium in Iraq as reason enough to go after the man he already wanted to kill. Dr. Theodore Postol has won many awards as a professor of science, technology, and national security policy at MIT. He specializes in ballistic missiles and chemical dispersion clouds. He helps the US government with its weapons program and trains other scientists in weapon technology. 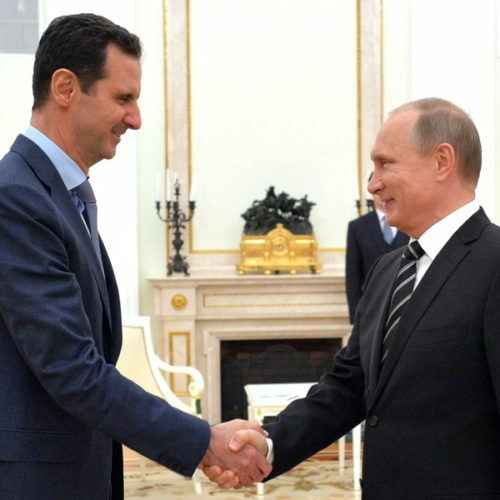 Postol debunked the 2013 claims that a chemical incident was caused by one of Assad’s missiles. Briefings, such as his, that countered initial information linking the chemicals to Assad are why Obama did not follow through with his red-line threat. Trump, by contrast to Obama, has been immediate in leaping to the conclusion that Assad did this, even though common sense begs one to ask why would Assad do that, knowing it would bring the US directly against him and knowing gassing civilians, especially children, would accomplish absolutely nothing in terms of eliminating his opposition? It would seem he would be even less likely to do such a completely useless thing when you consider that the chemical incident happened only about a week after Trump stated his administration would be no longer be seeking regime change and offered Assad a deal that would keep him in power. Why would Assad just throw that off the table? …the government’s new report is] obviously false, misleading and amateurish…. What the country is now being told by the White House cannot be true. Obama’s war in Syria has the potential to widen into a worldwide conflict. No, dopey, I would not go into Syria. President Obama, despite having publicly declaring [sic.] the use of chemical weapons by the Syrian regime a “red line” which, if crossed, would demand American military action, ultimately declined to order an attack, largely on the basis of warnings by James Clapper, the Director of National Intelligence, that the intelligence linking the chemical attack on Ghouta was less than definitive. “Dropping bombs on someone to prove that you’re willing to drop bombs on someone is just about the worst reason to use force.” The media, Republicans and even members of his own party excoriated Obama for this decision. Yet, isn’t dropping bombs just to prove you’re willing to drop bombs on someone the only thing Trump accomplished in Syria? He spent about $50 million dollars to launch 59 cruise missiles in order to take out seven badly aging airplanes (some of them fifty years old) and to dent a runway. We’re talking a pothole, not a crater, which put Assad’s forces out of commission for less than half a day. (Does the military even bother to evaluate cost effectiveness? Fifty-million dollars for a chip in the old concrete and the scrapping of some ancient hardware? Not a very smart businessman’s choice.) Trump’s attack didn’t even blow up the bunkers the planes were sitting in — just covered them with black soot. Of course she really believes that! Regime change was always Hillary’s plan, and seeing that she was such a warmonger is one of the big reasons many people voted for Trump because he spent a lot of time talking about how foolish all this regime-change nonsense has been and what a massive expense it has been to the US. Read some of the articles quoted above, and you’ll see there is plenty of evidence that says the chemical incident in Syria bears further exploration before rushing into another attempt at regime change, yet rush we did, contrary to everything Trump said about war in Syria prior to becoming president. In my next article, I’ll lay out the numerous total reversals involved in the transformation from Candidate Trump to President Trump. Months ago, I lost readers and websites for pointing out that these reversals looked likely to happen, but now the Trump make-over is nearly complete, and the examples of utter contradiction are abundant and obvious, even to some of Trump’s most ardent supporters as you’ll see that article later this week.